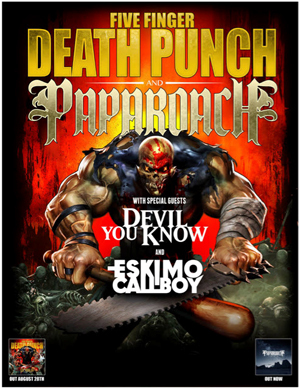 DEVIL YOU KNOW will be joining FIVE FINGER DEATH PUNCH and PAPA ROACH for a massive European tour, which kicks off November 2nd and wraps up at Wembley Arena in the UK on November 28th. This trek also marks the group’s first European tour ever, so don’t miss out on one of the tours of the year if it comes your way. However, North America, don’t worry, as DEVIL YOU KNOW will be touring with COAL CHAMBER and FEAR FACTORY this July/August. There will also be five, very special headlining dates throughout this touring run. See all dates listed below and be sure to stay tuned for all news and studio updates. DEVIL YOU KNOW are currently recording their sophomore release with renowned producer Josh Wilbur. The group are poised to deliver one of the most crushing metal releases of the year through Nuclear Blast Records worldwide in November. Howard Jones (vocals) states: "We are beyond excited to announce we will be coming to see all our European metal brothers and sisters for a massive tour this November. The best part is that we will be there alongside the mighty FIVE FINGER DEATH PUNCH and PAPA ROACH! We've been anxiously waiting to get back to Europe for our first ever full tour, and now thanks to our good friends in FFDP it is finally happening. We will be doing meet and greets each night after our set at the merch booth and look forward to meeting as many of you as possible. Please be sure to come and say hello. "Right now we are in the studio recording our new full-length album, so this tour is the perfect opportunity for us to feature some brand new songs live and also beware, as we might have another very special surprise at some of these shows. Get ready Europe, it's game on! “Also, we will be doing only five, very special one-off headlining shows across North America during the COAL CHAMBER and FEAR FACTORY tour. If you are in those areas (see dates below), you don’t want to miss out on these intimate, extended set live shows. It’s going to be a rager. See you all very soon."